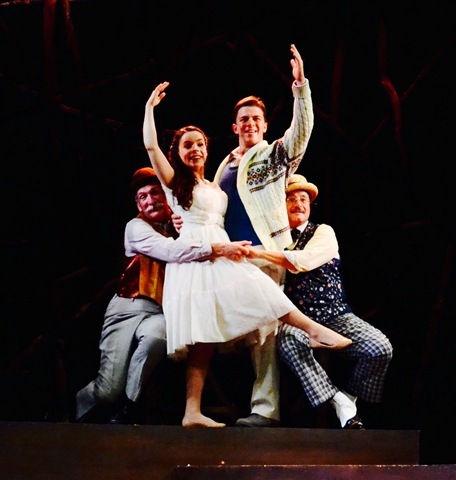 FORESTBURGH, NY (August 26, 2015) – The Fantasticks, a classic and enduring musical, winner of Tony Honors for Excellence in Theatre with music by Harvey Schmidt and lyrics by Tom Jones, opened to an energized full house and standing ovation at the Forestburgh Playhouse Tuesday night. Superficially, the show is a sappy, almost maudlin romantic musical with an overwhelming emotional appeal so universal and unlimited it ran for 17,162 performances at the diminutive Sullivan Street Playhouse in New York City’s Greenwich Village. Franklin Trapp with a cast and company of dedicated Playhouse thespians has churned up a brilliant presentation of this never-to-die, fanciful musical. The combined efforts are a shining explanation of the musical’s historic off-Broadway run. The thematic appeal of young love, passion, and parental meddling is universal, as it crosses the time zones of generations and the barriers of ethnicity. To convey the appealing and emotional concepts present in The Fantasticks, requires a level of intimacy frequently established with the aid of a small stage and a creative set designed with the involvement of the audience in mind. This is exactly what Scenic Designer Bradley Wehrle has cleverly accomplished with the suggestive, abstracts elements of the stage design. Take for example “The Wall.” It’s there, but it is not really there. By employing its collective imagination, the audience at the Forestburgh Playhouse is emotionally drawn early into the play’s multiple levels of association. To further assist the characters with the movement of the plot, Harvey Schmidt and lyricist Tom Jones have written in a narrator, who also serves effectively as El Gallo, the rooster. The production is smoothly directed by Scott Evans, while Morgan McCann’s moves and gestures convey the “cockiness” of his character El Gallo, advancing the purposes of his duel role as the omniscient Narrator. As has proven to be a most successful technique, during this summer’s theatre season, Franklin Trapp has collected and artistically utilized a team of multi-talented actors in the Playhouse’s ResCo. The Fantasticks is written for a cast small in number. In addition to others and The Narrator/El Gallo are two shining examples of the company’s talent and appeal. Marissa Gingus, easily and effectively portrays The Girl, an incurable romantic, in love with all that is characteristic of a rich if not extravagant imagination. Her duet, “Metaphor” with The Boy, Hunter Brown, is a prime example of her poise and ability to hold the stage. Further and to the show’s advantage, Marissa is comfortable and familiar with the role, as she convincingly portrays a sweet though naive young lady. 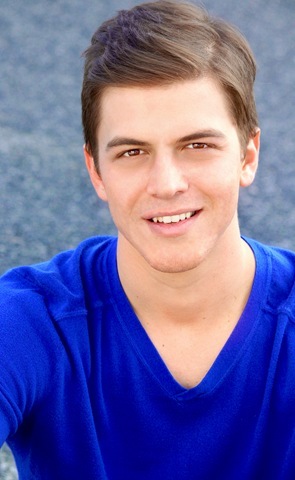 Complementing Marissa is Hunter Brown; a brilliant ResCo member who skillfully displayed his abundant talents in the season’s opening production, Damn Yankees, where he effectively represented Joe Hardy, the Senator’s fan who sold his soul to the devil to defeat the much despised NY Yankees baseball team. In this wistful production featuring youth and love, Hunter’s abilities on stage are put to good use as he strikingly represents The Boy in love, another romantic who sees himself in terms of unabashed gallantry, not necessarily tilting windmills, but a veil of untarnished bravado surrounds his lance. One of the more comical teams to appear in this stellar cast of The Fantasticks is that of Boy’s Father, John Little and Girl’s Father, Michael Iannucci. Each of these two fine actors is experienced in various genres of theatre and consequently able to work a set of silly, absurd circumstances into credible comedy. The accomplishment requires timing and coordination between the two, with the mix categorized as an “essential,” and on full display in the presentation of their two preposterous duets: “Never Say No” and especially “Plant a Radish.” These guys know theatre! Rounding out the use of the ResCo in this nostalgic production of a musical classic is a skillful and hilarious Cody Cooley, as The Man Who Dies / Mortimer. His totally bizarre costume for the fight scenes are on target with his over-the-top acting abilities. Cody’s costume is a credit to Costume Designer Genevieve Beller, who must receive additional attention for similar levels of hilarity with costumes for The Old Man and Henry, brilliantly brought to life by Chet Carlin. Cody as The Man Who Dies (Mortimer) and Carlin as The Old Actor (Henry) collectively bring to the stage two out-of-place, out-of-time character actors, anachronisms. Each serves the dramatic function of a catalyst, i.e., moving the plot along, but not affecting direction or outcome. To further sing the praises of the ResCo is Chiara Trentalange. She, Chiara, is a talented and tested veteran of the Forestburgh Playhouse. 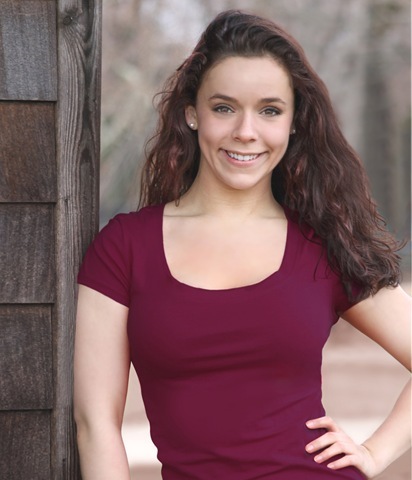 Her acting, vocal and dance attributes were especially evident in the recent production of 42nd Street and throughout the season in the highly entertaining main stage and Cabarets at the Forestburgh Tavern. In this production of the Fantasticks it is Chiara’s versatility that rises to the top, as she does not sing a note, but eagerly and ironically represents the highly functional character of The Mute. Without Chiara there would be no props, no wall, and no symbolic, gentle snowfall. Editor’s note: The Fantasticks continues to play in New York City at the Jerry Orbach Theatre, 210 West 50th Street. The theatre is named after the actor who debuted the role of El Gallo.